If you’re looking for coach hire in Birmingham, or are heading to Birmingham from somewhere else, then why not let National Coach Hire organise your trip? We are experts in all things Birmingham, and can source the best coach hire quotes in and around the Birmingham area. Birmingham has long since moved away from its reputation as a grim, industrial city and has, over the last few years, managed to successfully swap manufacturing for culture. As such there are few more exciting and vibrant cities to visit for food, nightlife and entertainment. If you are planning a trip to Birmingham, or wish to use it as a base to explore the Midlands, ‘the heart of England’, then coach travel is the only way to appreciate this exciting city and the beautiful countryside on its doorstep. On the surface Birmingham still shows some remnants of the bombing in World War II and the disastrous town planning which for so long defined it as a city. But nowadays, Birmingham has transformed itself, (and is still changing) bit by bit into a modern and imaginatively designed city, with much to see and do. Whether you are heading there to see a concert, exhibition or conference at the National Exhibition Centre, or perhaps you are heading to Birmingham to watch the football at Villa Park, home of Aston Villa, or the cricket at Edgbaston, home of Warwickshire County Cricket Club, then why not let National Coach Hire organise your trip? Moreover, whatever your reason for heading to Birmingham, coach hire allows you to experience more than you would expect from this fascinating and beautiful area. From a tour of the city centre and the distinctive Rotunda Tower, to the stunning Bull Ring Shopping Centre and the space-age Selfridges Store, made of a dramatic ‘skin’ of 15,000 spun aluminium discs, one thing Birmingham provides is retail therapy. One of the largest shopping centres in Europe you could spend hours and hours, (and lots of money), wandering around under the famous ‘Sky Plane’ roof. And when you’re done, why not throw the bags in the coach and move on to the city’s famous Jewellery Quarter, or stop for the day and move on to what Birmingham does best, eating and entertaining. From the Birmingham Symphony Orchestra, to the hundreds of bars and nightclubs, to the incredible array of restaurants around the Mailbox area and the Chinese quarter, there is something for every taste. Most famous of all is that Birmingham speciality, the Balti curry, and with some of the best restaurants in the suburbs of Balsall Heath, Mosely and Sparkhill, why not let the coach take care of getting you there safely? 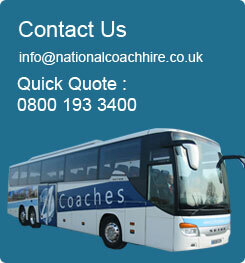 Coach hire also lets you move out from the city and experience some of the very best of the Midlands. From a day of overindulgence at Cadbury World, to the stunning Warwick Castle, still beautifully intact, and the moody ruins of Kennilworth, to, most famously, Stratford-upon-Avon, home to England’s favourite son, William Shakespeare, the Midlands have everything. The landscape varies from the stunning rural Moorland tops and walking trails of Britain’s first national park ‘The Peak District’, to the stone buildings of many ancient villages, to the caves and spas around Buxton and Castleton. Why not use coach hire as a way of trying out parts of the Penine Way, the 268 mile long footpath stretching through the Peak District, and perhaps better appreciated in smaller sections! Whatever your needs, National Coach Hire can help you experience and truly appreciate both Birmingham and the wonderful landscape in its backyard.